This week I visited Berlin to talk employee advocacy and social leadership with internal communication professionals and executives using social media. A key part of this session focused on leadership social coaching because social business has to start with social leaders. 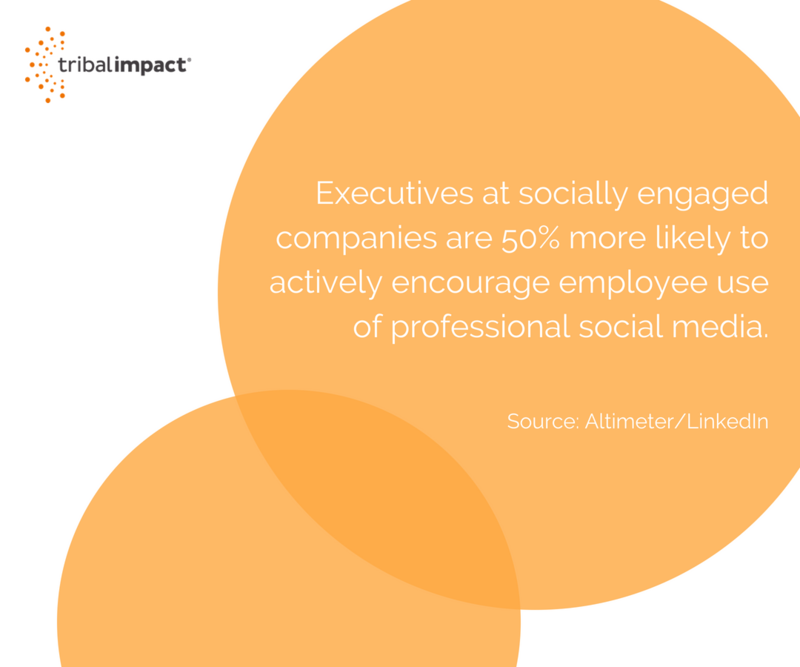 Altimeter/LinkedIn research shows that executives at socially engaged companies are 50% more likely to actively encourage employee use of professional social media. This is a guy who has a special line on his office phone so he can instantly listen into random customer service calls without anyone knowing to check-in on the customer experience. Someone who understands the value of listening and the transparency of social leadership. However, too many leaders are shying away from stepping into social. In fact, just 61% of the Fortune 500 CEOs have no social media presence. Why? I’ve heard nearly every reason in the book including lack of time, don’t know how to, social media is for my kids and the best one…I have nothing to say. So, how do you get your leadership team embracing social? Not every leader is going to become a social superstar. Instead, focus on 1-2 leaders that are interesting and willing to experiment. Check their LinkedIn profile. Are they well connected? Are they already active on social media? Ask them if they’re interested in building their professional brand online and set their expectation up front. Tell them that you will give them the coaching support but they must commit to investing time - approx 1-2 hours per week. It’s important to frame the benefit message of becoming a social leader in a language they understand. Talking to an HR leader? Then focus on employer branding, referral recruitment and employee engagement. Talking to a Sales leader? Focus on quota attainment and deal closure times. Source the evidence (there’s enough research out there), build your case to win leadership confidence up front and set an objective that relates or supports a KPI they care about. Slightly controversial and a little bit of a risk but most leaders won't have reached that level in their career without watching their competitive peers closely…especially if they’re in sales. Take some time to do your research and share what other executives in similar positions are doing within the industry. Show them profiles, activities, content shared and explain the potential impact as a result. If you can, try to access brand social listening reports - most organisations managing branded social media channels will be monitoring conversations...I hope! Show your leadership team real conversations that are happening around your brand. If you have sophisticated listening in place you will be able to monitor the volume of brand conversations compared to your competitors, analyse sentiment and pick out key themes/topics that are trending around your brand. Tip #5 – Make It Easy. Mobile First. Executives are busy people. They travel, they meet, they travel. If you don’t give them mobile first social media direction, it will never work. Employee advocacy tools are a great introduction for busy professionals that don’t have time to search and share content. If you don't have the budget for a tool, set your executive up on Flipboard (a mobile content aggregation tool) Find and follow topics, add social accounts that interest them and show them how to share directly from Flipboard to their network. Building a habit takes repetition and perseverance. Provide a social routine that isn’t too taxing. For example, start week 1 by asking them to follow the “Rule of Threes” - make three new connections, share three pieces of content and engage (like/comment) on three posts. It should take no longer than it takes to drink a cup of coffee. In fact, consider suggesting a time when they do it e.g. the morning commute, waiting in line at the airport. Keep it simple for the first couple of weeks and then add to it. Finally, schedule regular check-in calls. At the start of the process check their SSI score and/or KLOUT score. Give them a baseline. After a week, check-in with them to see if they’ve managed to build a social habit into their daily routine and review their SSI and/or KLOUT score. Check their activity to see whether they received any engagement on posts shared. Little wins will show it’s working. The more active they become, the quicker they’ll experience social success e.g. their network interacting with them. Supporting to leadership to be more socially active takes time. These tips are based on my experience of working with leaders to help them adopt a more social approach to business by executives using social media. The same process doesn’t work for all. Some will adopt a social habit quicker than others so be flexible in your approach and adjust the routine if it’s not working for them. Focus on the little wins and if you can, relate their success back to a KPI or objective they care about. Good luck!